Although commonly called different names, the grizzly bear and the brown bear are the same species. The “grizzly” name comes from the bear’s fur, which can be white-tipped giving the bear a grizzled appearance in certain lights. In the contiguous United States, female grizzly bears reach a weight of between 250 and 350 pounds, with males being nearly twice that size. These bears can live as long as 40 years in the wild. In one year, a grizzly bear may roam more than 60 miles in search of food. While grizzly bears prefer forests and wooded areas surrounding lakes and streams, these highly adaptable creatures can be found in a variety of North American habitats, including areas with human dwellings and settlements. Historically, grizzly bears lived throughout the United States and Canada. Due to habitat destruction, grizzlies now occupy less than 2 percent of their historical geographical range. The largest populations of grizzly bears in the contiguous United States are found in the Yellowstone and Tetons National Parks. Generally, a grizzly bear’s home range may encompass an area covering 1,000 to 1,500 square miles. Grizzly bears are solitary creatures, and one individual’s home range may overlap with that of others. The size of a home range varies from year to year depending on food availability, weather conditions and interactions with other bears. 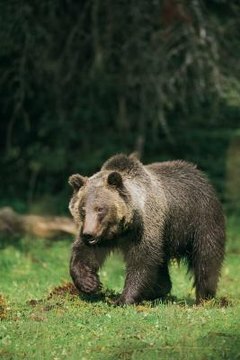 While the range of a female with cubs may be limited to just one or two river valleys, a male grizzly needs a cluster of several interconnected watershed zones. Typically, the home range of an adult male grizzly bear is between two and four times the size of an adult female’s. The omnivorous grizzly bear is an opportunistic forager and feeder. These bears primarily consume fish, plants, small mammals such as squirrels and carrion. They also hunt hoofed animals like elk and deer. Grizzly bears spend most of their time alone, although cubs stay with their mother for over two years. Larger congregations of grizzlies can be found every year at popular Alaskan and Canadian fishing spots, when salmon swim upstream to spawn. Grizzly bears spend up to seven months each year hibernating, as food is scarcer during the winter months. While an estimated 31,000 grizzly bears live in Alaska, there are fewer than 1,500 individuals in the lower 48, mostly in national parks. While those parks have laws and regulations protecting the bears, even the parks are not completely safe habitats. Increased logging and road construction isolates the bears and fragments their home ranges. Human-bear conflict is a problem on the fringes of protected territories, where bears may attack domestic livestock. The National Wildlife Federation has programs to purchase grazing rights to park-bordering lands from ranchers, in hopes of decreasing such attacks.